New York: Bantam Books, 2015. 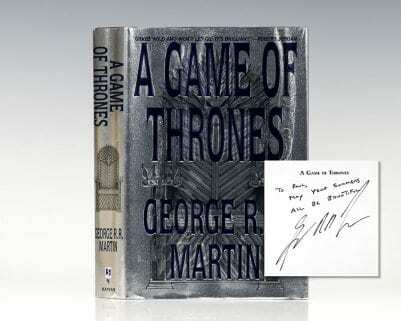 First editions of the leather boxed edition set of each of the five volumes in the author’s Game of Thrones series. Octavo, five volumes, original leather. Each volume is signed by George R.R. Martin on the title page. Each volume is in fine condition. The box is in fine condition. The Game of Thrones Series has been likened to Tolkiens Lord of the Rings saga and T.H. Whites Once and Future King. Critics call this "one of the best fantasy series ever written" (Denver Post). The books in the series have sold more than 15 million copies and have been translated into more than 20 languages. The Game of Thrones: A Song of Ice and Fire Saga:] A Game of Thrones; A Clash of Kings; A Storm of Swords; A Feast for Crows; A Dance with Dragons. 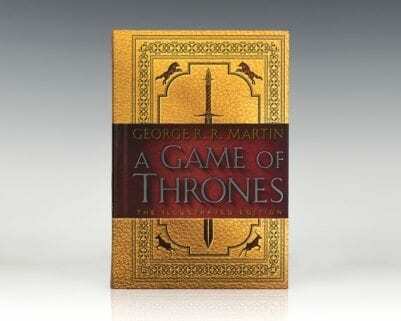 First British editions of each of the five volumes in the author’s acclaimed Game of Thrones series. Octavo, five volumes, original cloth, cartographic endpapers. Each volume is signed by the author, George R.R. Martin on the title page. Each volume is fine in near fine to fine dust jackets. An exceptional set. 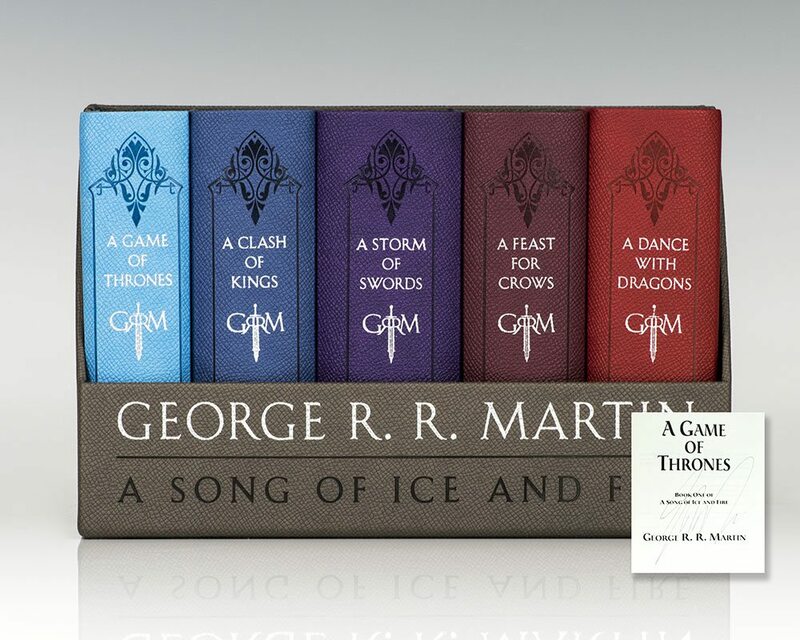 First editions of each of the five volumes in the author’s acclaimed Game of Thrones series. Octavo, five volumes, original half cloth, cartographic endpapers. Each volume is signed by the author, George R.R. Martin on the title page. Each volume is fine in near fine to fine dust jackets. New York: Tom Doherty Associates Book, 2014. First edition of this fantasy novella by George R.R. Martin. Octavo, original boards, pictorial endpapers. Signed by George R.R. Martin on the title page. Fine in a fine dust jacket. Jacket art and illustrations throughout by Luis Royo.